My cat, sniffing his crack. My cat has a bad crack sniffing habit. Most people smoke crack. My cat sniffs it. We all know that cats do silly things. Hell, cats do stupid things. Well, mine does. In the back garden of our soon-to-be-old house, there’s a crack in the cement leading down to the lawn. Every day, after having a bit of breakfast, my cat goes to the door and sits there. I then speak to him in the Sylvester dialect of cat, which sounds something like ‘Merwygowout?’ with cat-like inflection. He then looks at me as if I’m some sort of incredibly dim, bald and smelly cat, and replies with a positive ‘meow’. 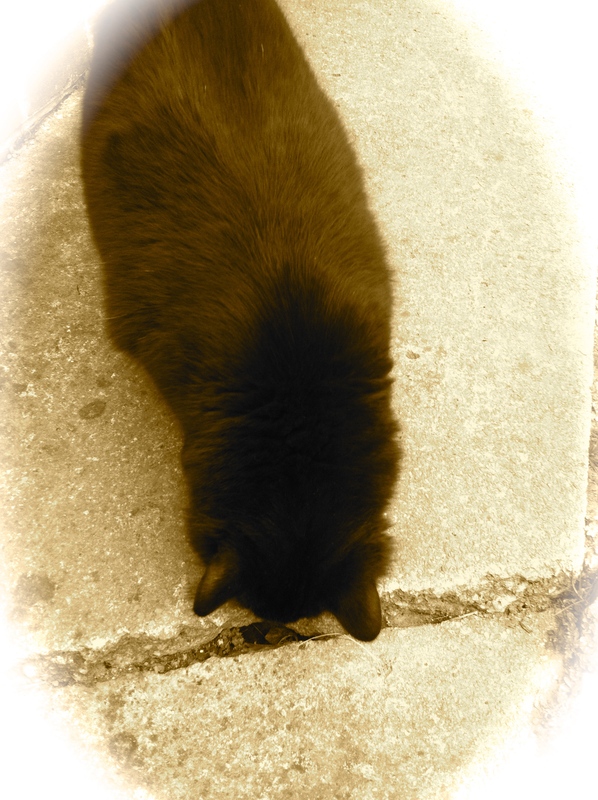 Dutifully, I let him out and he walks down to the crack, settles himself and starts to sniff it. He will then go about his daily business, but will often return to sniff the crack. As you can see from the photo, there seems to be a tunnel. Finally, I decided that I would take a photo. Then I decided that I would apply a crappy filter to make it more ‘out there’ in order to tie-in with my theories below. God knows what’s down there, he’s been doing it for two years now. I have a sneaking suspicion that there’s a Kidney Stone Gremlin who, having been sniffed at for two years, has given up his vow of abstinence and has decided to inflict a punishment on the foolish human who sends a cat to sniff him out. If so, I’m going to pour thirty litres of bleach down there and finish him. That or, even better, there’s a passage to Narnia or another world and all I have to do is work out how to get down it. “Most people smoke crack.” Really? Maybe in your neck of the woods that’s how they while away the days but down here very few do.